It didn’t take more than one variety of a tender, leafy green to make this simple pasta come alive with the essence of spring. While a plentiful clutch of flat-leafed parsley might have sufficed, I think the sweetness and delicacy of pea shoots made it something to announce. I found these very young pea shoots at the bins of Evolutionary Organics’ stand, which always has excellent mixes of baby lettuces with spicy mustard greens. These young sprouts don’t spend very much time in the soil before being clipped — and watch out, because they won’t spend very much time in the refrigerator afterwards, too. Farmer Kira somehow manages to have just the brightest, freshest, bounciest baby greens like these out, and pea shoots were a newer arrival last Saturday at the Grand Army Greenmarket. These tendrils are the first cuts from the pea plant, before they become tougher and eventually grow pods with more peas (which are the plant’s seeds) inside. You often grow it for either the shoots or the legumes (peas) themselves; otherwise, the sweetness and softness of the shoots are compromised, or the peas never have a chance to grow. But you can have it both ways, if you don’t mind tougher pea shoots that need to be cooked a little before eating. That’s what I discovered while growing peas myself a couple seasons, and also from eating more mature pea shoots in Chinese cuisine, which are usually lightly sauteed and called dou miao. So even though I had very young, tender pea shoots to work with here, I still gave them a quick toss in the pan to just wilt them, bringing out their color and sweetness along with a gloss of oil. They can be eaten fresh as a salad green, but perhaps try them out both ways here for contrast: lightly sauteed with the pasta, and as a crisp garnish to top. Thinking of the evolution of this little legume, I thought I’d pair it with another one — still in its seed, or bean, state. Cranberry beans are of the “pole bean” family, meaning, they need a pole to wind around as they grow upwards. Once their pods have matured and beans have been shelled, they can last dried for, I don’t know, years on end? 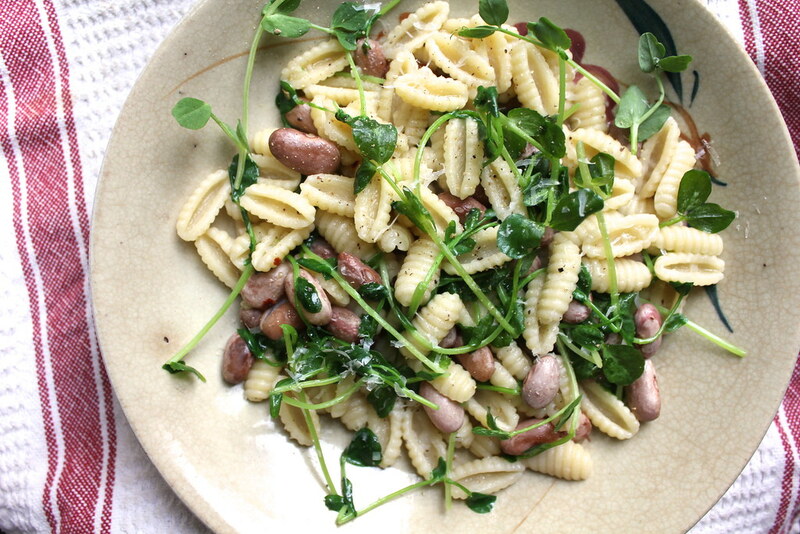 However long ago they were harvested, these cranberry beans were available at Cayuga Organics’ stand at the market, and their pink, speckled complexion seemed like a great color contrast for the pea shoots and pasta. You could use any pasta, of any shape, even the long strands for this. 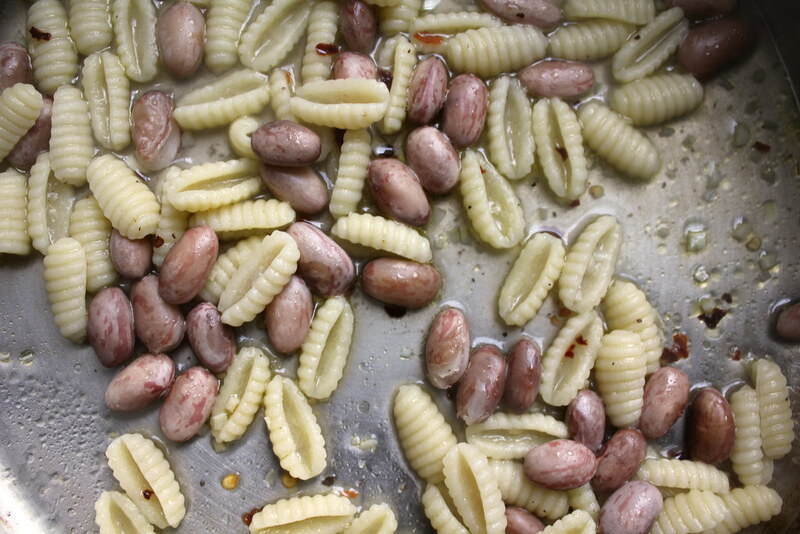 I wondered if the beans would insert themselves completely inside the curled shape of the cavatelli while I stirred this in a pan. They didn’t really, as you can see. Maybe shells or logs of penne would have sucked them in spontaneously during this step. But it’s not really necessary, obviously, just a goofy hope that didn’t pan out. For extra richness, add more pats of butter and shavings of Parmigiano Reggiano than called for here; for a vegan-friendly fix, skip them for an extra drizzle of good extra-virgin olive oil. (Swap in gluten-free pasta if that’s your calling as well.) The hearty, cured meats and canned tomatoes can take a break now that spring has sprung. 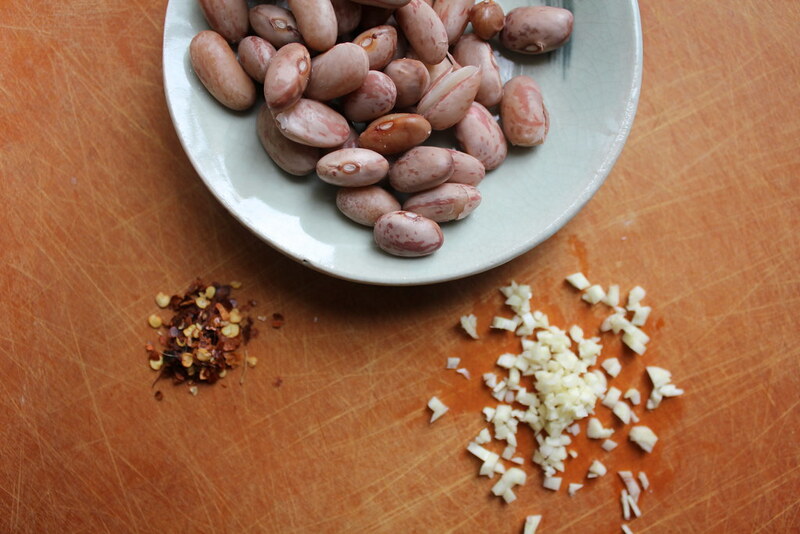 Drain the soaked beans and cover with at least three inches of cold water. Bring to a boil over medium-high heat, and reduce to a gentle simmer covered. Cook covered for at least 30 minutes, or until tender, which can take (depending on the beans’ freshness) up to an hour. Drain and set aside once tender. Bring a pot of generously salted water to a boil. Drop in the pasta, and stir frequently until cooked al dente (see cooking instructions on the package or taste). Drain but reserve 1 cup of the starchy cooking liquid. Meanwhile, heat the olive oil in a heavy-bottomed skillet or pot over medium-high heat. Add the garlic and optional chili flakes and cook until just fragrant, about 10 seconds. Add the beans and stir until coated. Add the pasta and its cooked liquid. Season with salt and pepper to taste. Once the liquid has almost fully been evaporated, remove from heat and add the butter and all but about one cup of the pea shoots. Stir to toss until the pea shoots are just wilted and incorporated throughout, and the butter is melted. Stir in the Parmigiano Reggiano and serve immediately. Five brownie points: This is a decidedly “light” meal suitable for warmer weather, but it still has its proteins accounted for — thanks to the beans. These tidbits might not taste like much and are full of carbs, too, but add fiber and fiber to your diet and zero cholesterol. 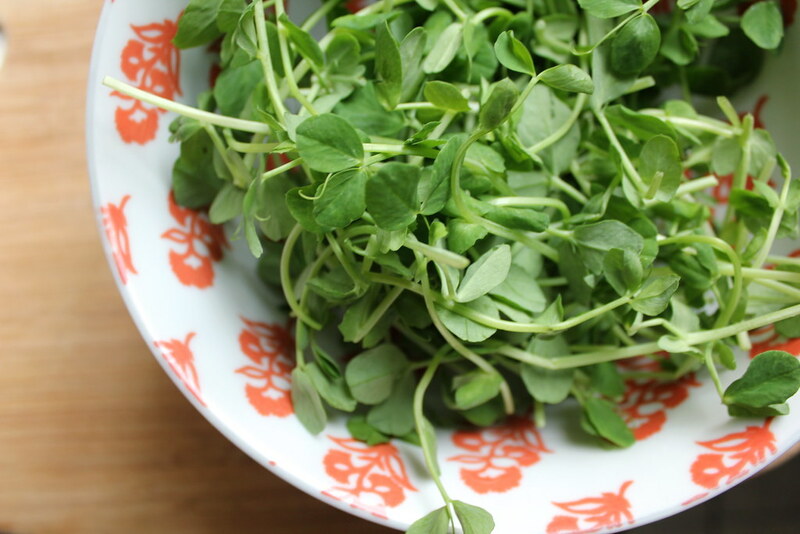 The pea shoots are chock full of vitamins, so cooking them a little so that they wilt and pack down a bit will add more of those to your diet than eating a bowl full of them raw as a salad. 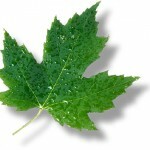 Seven maple leaves: The beans and leaves here were local and in season, but good olive oil and parmesan is hardly found in the Northeast any time of year. At least we can find good butter, and nowadays, locally made pasta from artisanal makers like Sfoglini Pasta Shop of Brooklyn, where I got my cavatelli. agents that exist because of reducing the size of the particles. drinks tend to be more cost effective than whole food. Your blender will explode if you add it all at once. Very interesting, a lot of games i see these days but i am most definitely interested in this checkers online playing game, just click that my suggestion http://onlinecheckers.net and get something smart board checkers.